Recommend a friend and claim £150! Know a driver who needs a new taxi? Please recommend them to us. In return we will pay you £150. The money's yours as soon as your friend buys a vehicle! Please fill in the form, takes 1 minute. We are keeping your details safe. 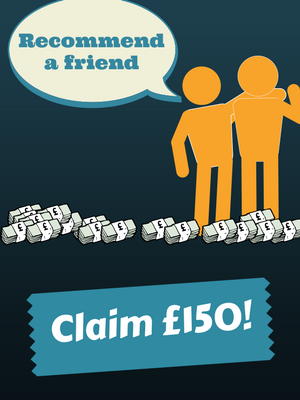 If your friend buys a taxi from us please claim your £150 introducer's fee. So, when they buy a taxi, make sure you get in touch - sales@thetaxishop.com or 01525 717 695 - and we will crosscheck our records to match your recommendation.